Most of us tend to place an enormous amount of trust in healthcare professionals such as dentists. We may not think twice about any safety and hygiene issues relating to our care. Instead, we simply follow instructions and assume that everything is being done as it should in the dentist's office. But unfortunately, not all dentists are scrupulously hygienic and committed to safety. Not only that, but even those who are can still be subject to things going wrong. Is there anything a patient can do to help ensure that each dental visit is a safe one? With the exception of following aftercare instructions correctly, there isn't much you can do directly. There are, however, things you can look out for in your dentist's office to ensure safety is adhered to at all times. It may seem minor but what your dentist is wearing can be important in helping to ensure hygiene in the dental office. A dentist should not be performing treatments while wearing 'street' clothes. Instead, a gown or smock should be worn and if it becomes soiled, it should immediately be changed. The more skin that is covered, the better, which means long sleeves are ideal on a gown. Your dentist should be wearing protective eyewear and a disposable facemask. As with clothing, the more protective wear your dentist has on, the better you are protected from contamination. Not only should your dentist frequently be washing his or her hands, but protective gloves should also be worn. While soaps that kill bacteria are important, they aren't able to kill all viruses. Protective gloves are vital to help prevent the transmission of disease. Gloves should be thrown out after each patient as well. You can even ask that your dentist put on new gloves in front of you. Be aware of how and what your dentist touches. He or she shouldn't be touching everything around them and then putting their hands in your mouth to perform work. 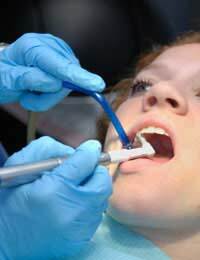 Each time the dentist comes into contact with another surface, the risk of contamination is increased. This can be minimised by your dentist only touching sterilised instruments before performing work. Other aspects of a dentist's office are not so much necessary as they are ideal. Some experts in the field of dentistry cite that foot operated controls are preferable to ones found on sinks that are operated by hand. This helps to reduce the frequency of your dentist's hands touching other objects that can bring unwanted viruses and bacteria to your mouth during dental procedures. Sterilisation is a mainstay at the dentist's office. Your dentist should perform heat sterilisation on dental instruments between patients. Simply using a surface disinfectant is insufficient for cleaning the inside parts of dental instruments. A prominent, highly publicised older case occurred in the late 1980s when an American woman named Kimberly was thought to have contracted HIV from her dentist after having dental surgery. Five other patients were also thought to have contracted the disease from the same dentist. Although the dentist did test positive for HIV, there was still some debate over whether he was ultimately the one responsible for the patient outcomes. While these kinds of cases are extremely rare, the use of gloves and other safety measures in place today means that the chances of this happening again are almost non-existent. As a dental patient, you have every right to a safe, hygienic and sterile environment. The last thing you want is to go to the dentist's office for a procedure and come out worse off than when you entered. Be aware of the measures in place for patient safety in your dentist's office and ask questions if you have doubts. You deserve a healthy environment but there is some responsibility for you to check that your dentist follows all safety and hygiene protocols.